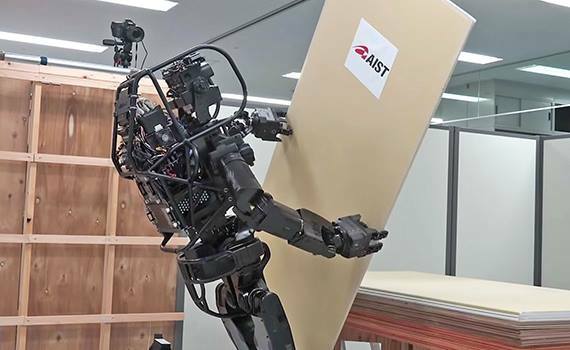 A new video from AIST, Japan's National Institute of Advanced Industrial Science and Technology, shows a prototype robot designed to work on construction sites in situations where there is a shortage of human workers. The robot in undeniably slow but also strikingly accurate, suggesting a future where humanoid robots could replace even more human jobs. On-site construction is another field that similarly has resisted easy robotic automation, with human labor still primarily relied upon for the building of houses in situ. Automated brick-laying robots and massive robotic 3D-printers are certainly offering intriguing possibilities for the future of construction but ultimately we still need humans to hammer these buildings together. This new Japanese research is less focused on removing the need for human workers but instead geared towards trying to deal with a problem unique to the island nation. Announcing the new robot, the researchers write: "Along with the declining birthrate and the aging of the population, it is expected that many industries such as the construction industry will fall into serious manual shortages in the future, and it is urgent to solve this problem by robot technology."